News Hounds: Brian Kilmeade & Mommy Blogger Attack LA School "Food Police"
Brian Kilmeade & Mommy Blogger Attack LA School "Food Police"
In the right wing world of Fox & Friends, it's all about freedom. For public school students, it all about the freedom to stuff fatty food down your gullet. And while the same right wing complains about funding Planned Parenthood, which provides health care to women, they have no problem with taxpayers funding school lunches that provide high calorie, low nutrition meals. Who cares about things like childhood obesity and juvenile diabetes. American youth are entitled to their taxpayer funded sweetened milk, chicken nuggets, and yes - that all American treat so beloved by "real America" - corndogs. But the evil, librul Los Angeles school district is taking away these healthy (just joking) foods. So it's no surprise that Fox & Friends tackled the topic as they have, in the past, expressed their concern about this violation of basic American freedom. Yesterday, Brian Kilmeade did his patented "comedy" which served to frame the issue as worthy of mocking. And while he hosted two people on either side of the issue, his female guest doesn't even live in the school district. But she's a Christian evangelical "mommy blogger" so she has some serious Fox & Friends creds. 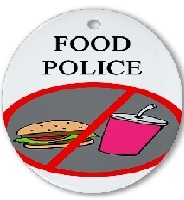 Kilmeade began the piece with this scary bit of agitprop: "The Food police strike again." He reported that chicken nuggets, corn dogs and flavored milk are no longer served in Los Angeles public schools. (Oh, nooooo) He said the goal was combating childhood obesity, but asked "are they taking it too far?" Elizabeth Esther said that her kids think that this is soo icky and if they were forced to eat the kinds of health foods being served in LA schools they would never buy school lunch again. And she thinks this is just soo icky and "too extreme" because OMG they're serving the kids tortellini with butter nut squash sauce and "who eats that!" She laughed uproariously at her comment. She said that while she might "choke it down" she didn't think kids would eat it. Kilmeade said right. She couldn't control her mirth when Kilmeade said "squash farmers across the world want an apology." Kilmeade then asked his other guest, Matt Sharp, a food policy advocate for the LA school district,"Don't you think you've gone too far, we all want kids to be healthy. Kids love nuggets?" Not amused, Sharp said that the new lunches are making it easier for students to learn good food habits which include exposing them to foods that they're not familiar with to develop new habits of healthy eating. Doing the patented scripted, leading Fox question, Kilmeade asked the widely grinning Esther if it's good to give kids pure, unsweetened milk. Mommy said that she wants kids to be drinking milk even if it's flavored. Not realizing that the public supports school lunches and shouldn't be paying for foods for fatties, she said suggested that it's the parents' responsibility to teach good eating. (Right, a huge percentage of adults, many of whom, presumably, have school age kids, are teaching their kids good eating habits? right..).She dramatically looked from side to side as she said that she didn't realize that this was the government's responsibility to teach children how to eat healthy at school. (What a coincidence - a right wing and evangelical talking point!) She predicted that trash cans will be full of discarded sushi rolls and butternut squash. Kilmeade referenced how the schools allocate 70 cents per food item and asked how the schools could afford sushi considering that he can't get it for 70 cents at the train station. (What, no Fox limo for Brain) Mommy's mouth opened into a big toothy grin as Kilmeade spoke. Sharp explained that schools have always tried to teach children good habits. He said that the schools are trying to support parents who are trying to teach their children to appreciate different types of food. Mommy twitched and made funny faces as he spoke. Brian "joked" that it will be a standoff with the kids staring at the squash, the squash stares at the kids and nobody eats anything. Comment: As part of "America's Newsroom," Fox & Friends loves that fatty food that is producing more fatty Americans. At least Kilmeade didn't bring in, as did Steve Doocy, Fox's Dr. Siegel to tout the value of this stuff. But in addition to being scared of Muslims, "illegals," and the "gay agenda," the Fox & Friends audience now needs to be scared of the "food police" cuz they're confiscating yer kids' corndogs and that's downright treason!